Like any major US city, you could easily spend a small fortune exploring San Francisco for a few days. And with good reason given the exceptional museums, restaurants, shopping and other attractions on offer. But if you’re on a limited budget you shouldn’t let that put you off. In fact, there are so many free things to do around the city that you don’t actually have to spend a penny more than you absolutely need to. OK, aside from $5.25 on a chocolate-dipped waffle cone filled-to-bursting with chocolate ice cream from Ghirardelli On-The-Go at Ghirardelli Square. I mean, that goes without saying. But, apart from that, as long as you’re prepared to do plenty of walking and invest $33 in a three-day MUNI Pass, which gives you unlimited rides on San Francisco’s iconic buses, trains, streetcars and cable cars, you’re in for a treat. San Francisco is very much a walking city. But once you’ve dragged yourself up a few of its notorious hills and lookout points you might feel you’re entitled to give those weary legs a rest. The good news is that you can buy a one, three or seven-day transport pass that allows you to jump on and off the various municipal (MUNI) modes of transport across the whole city. And let’s face it, you’re not going to visit San Francisco and avoid using the historic streetcars and cable cars are you? In fact, having paid our $33 for the three-day pass we spent a good deal of time just riding the cable cars up and down those famous hills to our hearts’ content. And when you consider it’s $7 per single ride, it’s a no-brainer. Just be aware that your three days need to be consecutive. They’re available at San Francisco Airport, Walgreens and other locations in the city. You can also purchase one with a MuniMobile app. To be honest, we found the printed route maps a bit confusing, so here’s a trip planner that might just save you some time. You could also upgrade to a CITYPass ticket, which for $89 includes entrance to a number of city attractions in addition to the MUNI Passport. Regular readers of our blog will know that we like to avoid crowds. And San Francisco’s Big Three – Alcatraz Island, Fisherman’s Wharf and the Golden Gate Bridge – certainly attract them in spades. So, when presented with this dilemma we always revert to our meticulously developed Plan A. Which basically runs along the principle of Getting There Before Anybody Else Does. We’ve written about how to plan an escape to Alcatraz with an early-bird ticket but as this involves shelling out a further $38 for the three hours-or-so tour, it’s not really something that fits well with this budget guide. That said, we thoroughly recommend it. Historic Fisherman’s Wharf, on the other hand, will empty your pocket in no time if you’re not careful. Home to seaside attractions such as Madame Tussauds and the Aquarium Of The Bay, along with plenty of seafood restaurants and boutique shops, it becomes a crowd magnet by mid-morning. But there’s still plenty to see without spending a penny. Not least the sea lions that hang out at Pier 39. And there are dozens of them. Afterwards, just stroll along the boardwalk before the crowds arrive and then head towards Ghirardelli Square for a sugar-boosting injection of chocolate. We couldn’t get enough of the Golden Gate Bridge, the enormous and outlandishly orange expanse of metal that’s most associated with San Francisco. For most of the summer months, it can be partly enshrouded in a blanket of fog which drifts in from the sea. Which, for many, is just as iconic a sight as the bridge itself. Although we were blessed with a clear, sunny day when we visited. But it fully deserves to be appreciated from a full range of vantage points, such is the ethereal beauty of its location as it straddles the Golden Gate Strait. You could easily spend a full day here exploring the areas surrounding the bridge, from Crissy Field all the way to Land’s End. If you do, you’ll be rewarded with spectacular coastal scenery, great beaches and a multitude of different perspectives of the bridge. For instance, take a walk down to Fort Point for a low-level perspective. Better still, take the coastal path and wooden steps down to Marshall’s Beach or even Baker Beach for unbeatable views. Just be careful with that zoom lens as both beaches attract their fair share of nudists. Of course, San Francsico’s architecture is not just about disused prisons, historic boardwalks and fog-bound bridges. In fact, it features a truly eclectic mix of styles that can be enjoyed on a combined walking and MUNI tour. For instance, you can discover styles such as Classic Greek/Roman (The Palace of Fine Arts), Art Deco (Coit Tower), Futurist (Transamerica Pyramid) and French Renaissance (City Hall). Perhaps most famous of all are the many colourful Victorian houses that somehow managed to survive the 1906 earthquake. Indeed, the Painted Ladies at Alamo Square are amongst the most photographed landmarks in the city. San Francsico has a long history of art and much of it can be seen from the street. For example, the 23 sculptured illuminated books suspended from steel cables that form The Language Of The Birds. 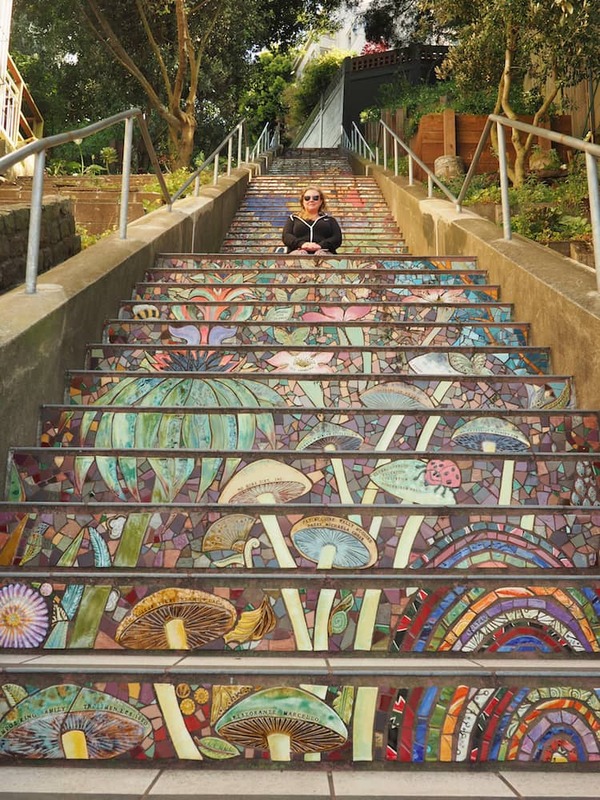 Just as impressive are the 16th Avenue Tiled Steps, a neighbourhood collaboration of mosiac tiles stretching the full length of its 163 steps. And while you’re in the mood for art, look out for some of the city’s incredible murals. Such as those inspired by human rights abuses in Central America on Balmy Alley. Or the community-based art of The Clarion Alley Mural Project. Don’t leave without at least seeing one of Diego Rivera’s three masterpieces, too. Especially The Making Of A Fresco Showing The Building Of A City, which you can see for free in the beautiful San Francisco Art Institute building. San Francisco’s skyline is as recognisable as they come. But, because of its many neighbourhood hills, it can be appreciated from a wide variety of vantage points. So, assuming you’ve got the stomach (or calf muscles) for it, make sure you hike up to at least one of the many options open to you. For instance, Bernal Heights Park features a panoramic view of the whole city, as do Twin Peaks, Grandview Park and the upper slopes of Buena Vista Park. Alternatively, there’s a much more intimate and hidden alternative at Ina Coolbrith Park in Russian Hill. There are indoor vantage points, too. Especially the Hamon Observation Tower, which is free to access from Golden Gate Park’s De Young Museum. The 360-degree views from here are spectacular. Unless you’ve decided to live in San Francisco or have the luxury of one or two weeks to explore it fully, you’ll probably find that there just isn’t enough time to fit in everything you want to do. Indeed, we thought we had our three-day itinerary well planned out but we inevitably had to disregard much of it. Mainly because we spent more time than planned around the Golden Gate Bridge and under-estimated all those hills and steps. As with all city breaks, planning your route will save you a lot of time. To help you, we can recommend the GPSMyCity Travel app, which provides offline walking guides to over 1000 cities all over the world. Including many in San Francisco. However, if you’re more inclined to just lose yourself in a particular neighbourhood and not be restricted to a set itinerary, then you’ll undoubtedly find enough there to get a feel for what this city is all about. To quote the great, late Anthony Bourdain, “Anyone who doesn’t have a great time in San Francisco is pretty much dead to me”. But it’s true that as one of North America’s great cities, it deserves a place high up on your bucket list. And, once again, you don’t have to break the bank to enjoy it. What did you think? Have you ever been to San Francisco? Or maybe you’re thinking of taking a trip there soon? Either way, we’d love to hear from you so please add your comments below. Wow! What an excellent blog! I’m never going to be able to visit, and my calf muscles DEFINITELY aren’t up to it, but this is so helpful and informative, and could save many a visitor lots of planning time. Perfect photography and writing, as per usual! Thanks, Lyn – Nicky’s calf muscles are still in shock, to be fair!